South Indian's love their rice and we are no exception. And I must admit R & me also have chappati/ roti atleast thrice a week for lunch. So we do have a balance act that we do. I constantly get asked this question from readers as to what to do with left for dosa batter? 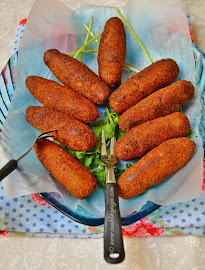 how to make perfectly soft idlies? how to make crisp dosas? and so on. I have posted my no fail idly dosa batter recipe which you would want to check as its the same batter that I have used for this recipe too. Coming to today's recipe Kuzhi Paniyaram is a favourite and quick to do snack/ breakfast recipe in most South Indian homes. 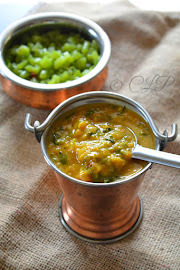 Today I will sharing a spiced version (kara paniyaram) recipe which is great to dip with any coconut based chutney. 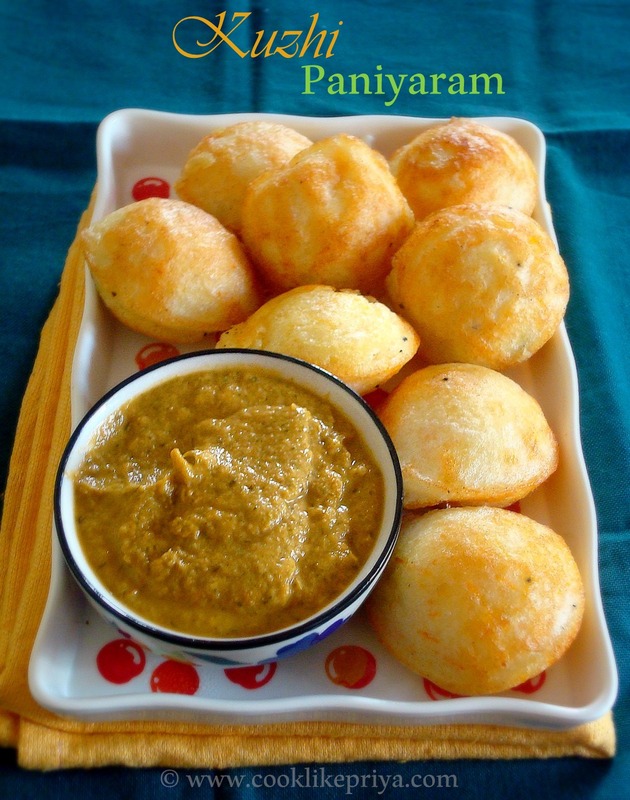 One good tip to get crisp and perfect shaped paniyaram without sticking to the paniyaram mould is to grease it properly and add a bit of rice flour to the batter. And never use freshly ground dosa or idly batter use the last set of batter and make the mix (ingredients) atleast an hour before doing paniyaram. This helps in developing flavours and also just 10 minutes before making the paniyaram add the rice flour to get crisp and perfectly shaped kuzhi paniyaram. I love fresh seasonal fruits, this year its been raining strawberries in the place I live. I love to source for ingredients that are readily available and try recipes to blog about them ;-) call me crazy that's understated. With a hectic weekend, Monday started off with all the agenda and to me cooking is therapeutic and with fruits I never say no. 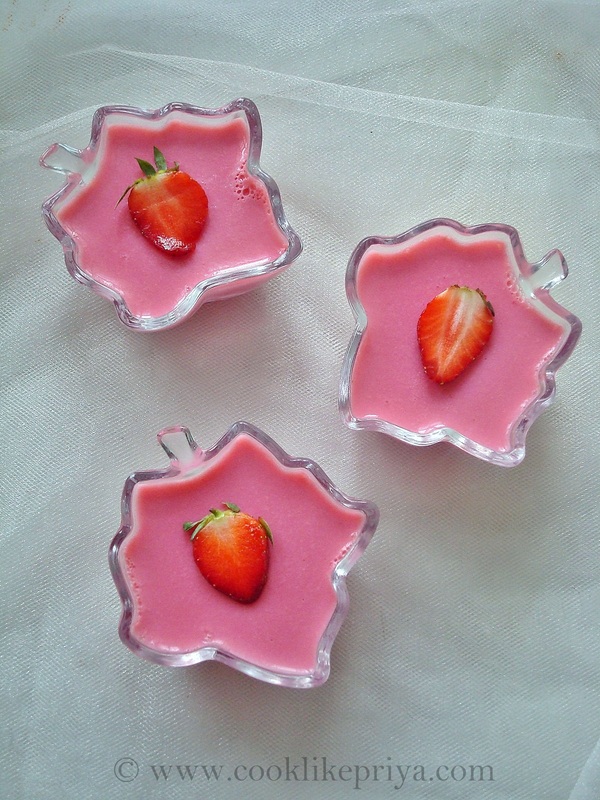 Today I wanted to kill time usefully hence churn'd out this simple dessert with pureed strawberries, condensed milk, milk and agar agar, the result was a simple delightful pudding that is free of eggs. If you are not sure what to make with strawberries this season, now you know :P. Its definitely a must try if you are a strawberry-holic or pink lover ;-). Long ago I tried using gelatine and feel sick in my stomach. Later I gotto know that gelatine was made of animal bones and I was shocked. Never did I ever go near gelatine again. China grass (vegetarian counterpart to gelatine) is the new gelatine that is safe and accepts well with me, a great gelling agent in puddings or custards. From a personal experience I felt that china grass gives a more light feel to the dessert compared to gelatine. 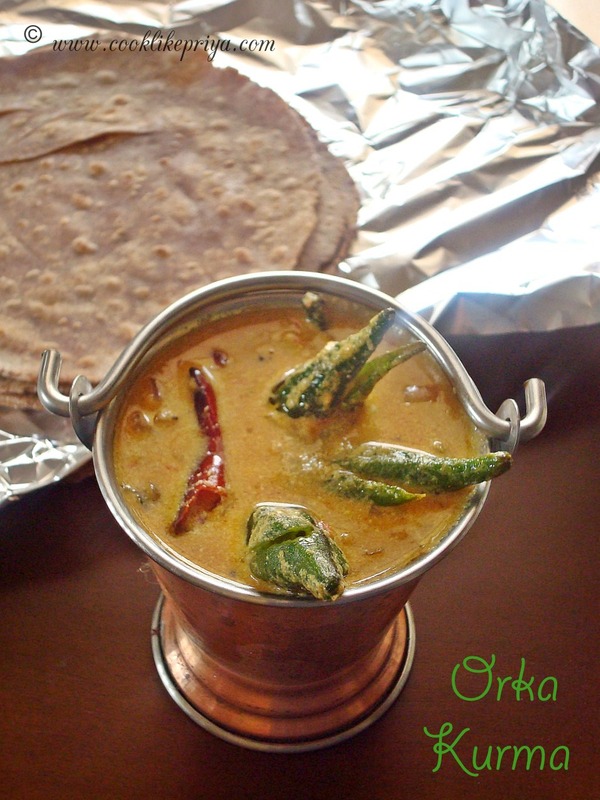 R & I love Vendakkai/ Orka / Bhindi & recipes with this vegetable is a sure must once a week. I remember Amma stuffing me with this vegetable during exams since they are said to improve memory power. That almost everyday after exam there would be vendakkai and moor sadam (buttermilk rice) for lunch :-) and I never complained. This combo still remains as my favourite no matter how many years pass by. I still have a memory of me with my book enjoying this for lunch. Red Velvet Jar cake recipe | Red velvet cake pudding recipe ~ Valentine's Day treat ! always perseveres. Love never fails".
" Love is a verb if not just a word" which is so true. This little jar cake is just my expression of love for my other half. Love you sweetheart. Happy Valentine's Day! Egg Dum Biryani / Restaurant Style Egg Biryani is a fragrant and tasty biryani. I have used whole spices to give the full flavour to this biryani. A ground paste is used to lift flavours to this dum style biryani which I did using my pressure cooker (since its a heavy bottom vessel) and of course without the weight. This is similar to the famous kachi birayani of Hyderabadi style. Now lets move on to the recipe. 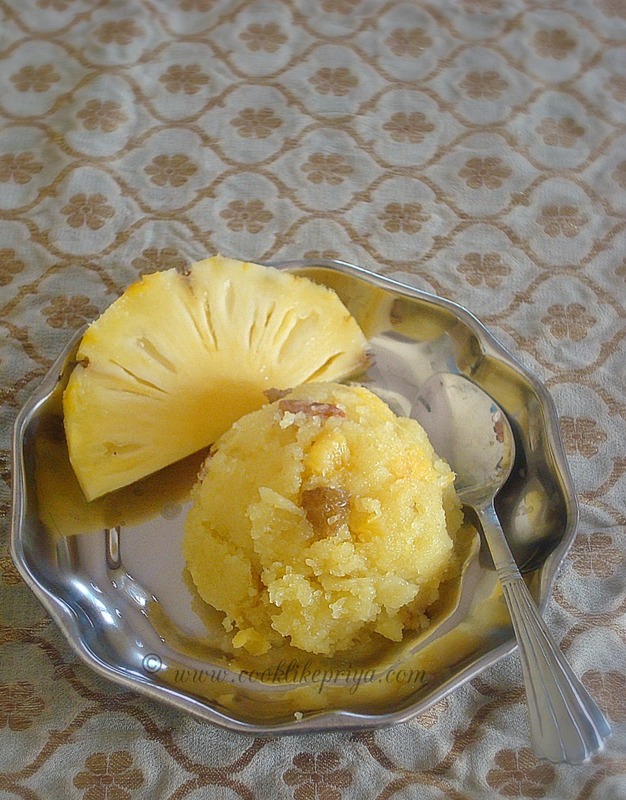 Pineapple Kesari | How to make Pineapple Kesari | Celebrating a million hits! A million pageviews hits and a million reasons to be happy. The first million is indeed special and I was super excited and wanted to pass a you all a big thank you by making this lovely Pineapple Kesari. Every special occasion calls for something sweet and today was no exception. I still remember the first 100 hits I reached, back then that was huge, now I find the first million huge :-) sure the future does look shiny and bright like this kesari. I would like to thank you all for all the support, love, care and concern that you have showed towards me and my blog. No words can describe how I feel today and I am really short for words, totally. 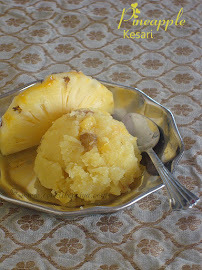 Pineapple kesari is a definite sweet that you will find in South Indian/ Tamil marriage dinner table. This ghee sweet is totally easy and simple to make with fresh pineapple pieces with a distinct pineapple taste that make it so heavenly. I had earlier posted Anandha Bhavan style Rava Kesari, which is one of the popular posts in blog till now. This Pineapple Kesari cannot be compared to that as both recipes are unique and hold a special place in my heart and tummy ;-). Now lets move on the recipe. 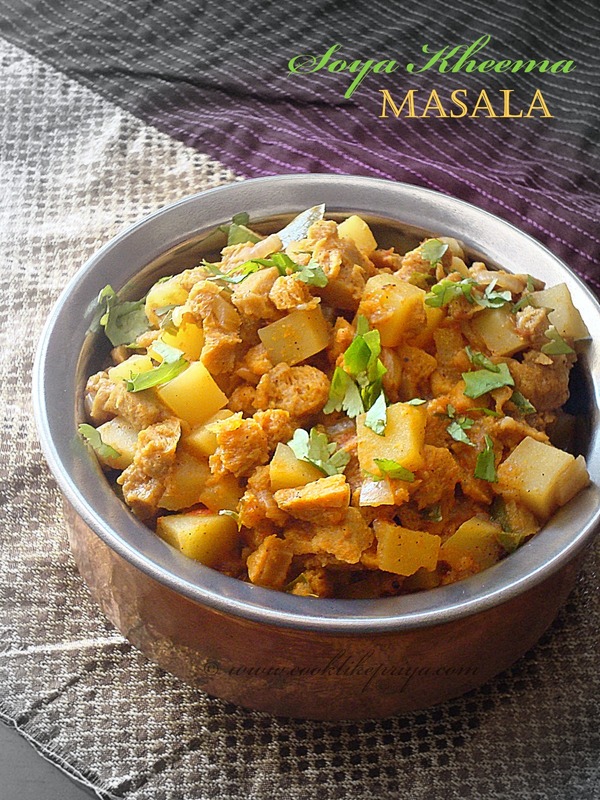 Soya Kheema Masala / Meal maker kheema Subzi is a tasty side that will go with dosas or with chappati or rotis. As we all know soya is a way to add protein into our daily diet, especially if you are a pure vegetarian. I find myself cooking with soya whenever we go on a vegetarian diet. Like I mentioned in my earlier post husband and I are on a veg diet. I made this kheema masala to go with soft chappatis for our lunch. To give more flavour and filling I added cubed potatoes just as the way we add potatoes/ green peas to meat kheema masala. Its always great to enjoy what your cook and eat. I truly believe that I cannot eat something that is not tasty and definitely not something that I don'e enjoy cooking. 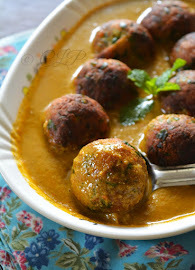 I have couple of recipes with meal maker or soya which I have posted earlier in my blog. You can find them listed at the end of the post. Oranges are in full bloom this season. Every week I never fail to bring back home a dozen oranges and enjoy them daily. Every time I think of cooking/ baking with oranges and it never happens. The fruit craze that I am end up eating oranges instead. This time I saved up 2 oranges just to make this cake since I had bookmarked it for long. 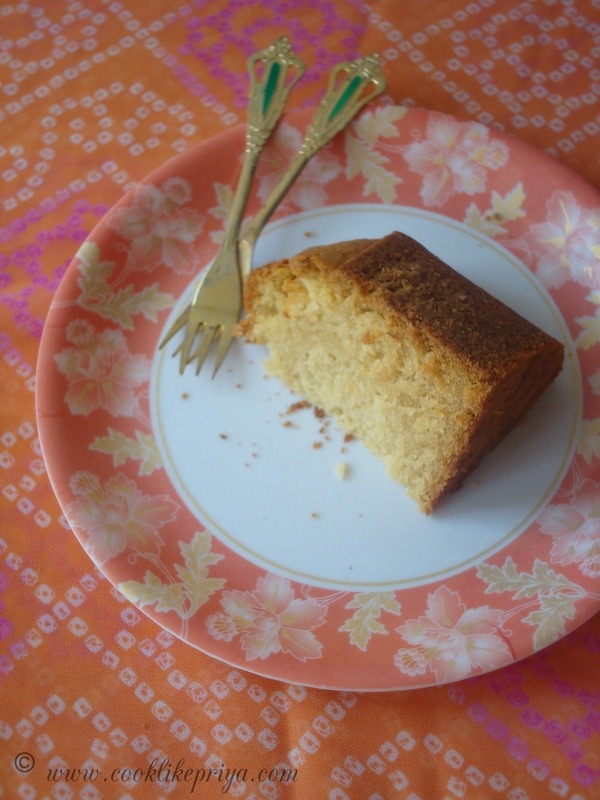 This recipe of Orange cake calls for no butter no eggs and no milk. Its a Vegan orange cake recipe that is so moist yet delicious with every bite. And you do not need an electric whisk/ have to keep the butter in room temperature none of it. Just a simple one bowl orange cake recipe. Isn't it too simple? I love snack cakes such as this. Now lets move on to the recipe. Husband and I are on a vegetarian diet and that's one reason why you would be not find non-vegetarian recipes off late. When we decided to go on this approach, my husband said no sambar and rasams try something different. Being a South Indian we almost live in our staples of sambar and rasam, we tend to cook them up atleast once a week. So I had to take this as a challenge and cook different vegeterian recipes to serve my picky eater. 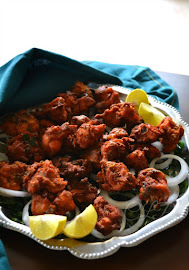 I had bookmarked this Chettinad Pakkoda Kuzhambhu for long and got to try this today. It turned out so good, by tasting it I can say it would go great with rice, dosa, idly or appam. The Curry is not spicy and mild in spice buy packed in flavour. Do give this a try if you want to try something different apart from the routine recipes. I love paneer & I love tofu equally since the latter is more healthy I end up picking tofu often than paneer. 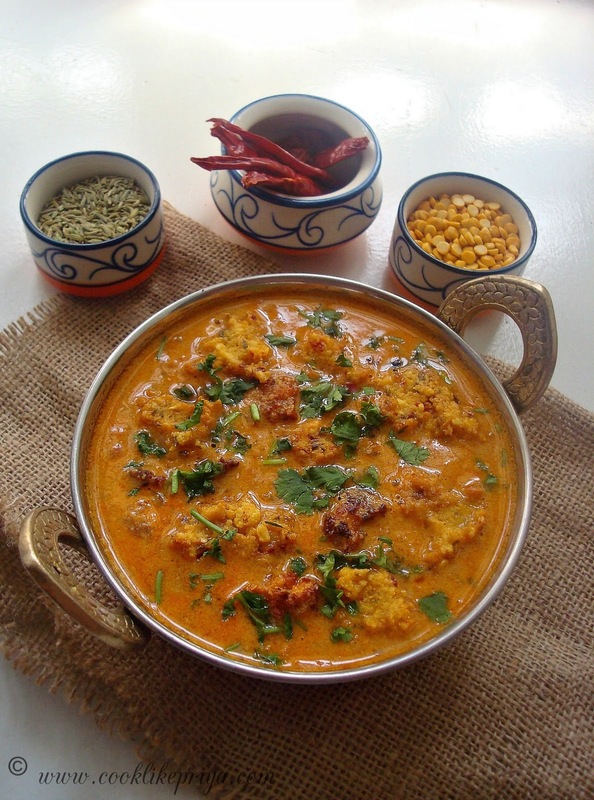 You can use tofu to make curries skipping paneer if you are diet concious. Nevertheless they both taste amazing. Unlike me, my husband was never a paneer person and of all the changes marriage does bring, food is a key factor that has changed us a lot. Now he loves paneer so much that he is finding it hard to eat tofu. That said I tried this Tawa Malasa as a virtual treat recipe from my dear friend +nalini suresh blog (naliniscooking.com). I was sure that my picky husband would definitely love this curry without any fuss and I was right ;-). A group of us blogger friends planned to surprise our dear friend Nalini with a virtual birthday treat, by trying one of her recipes and posting it in our blogs. I was a little late in the celebration but glad I did this curry. 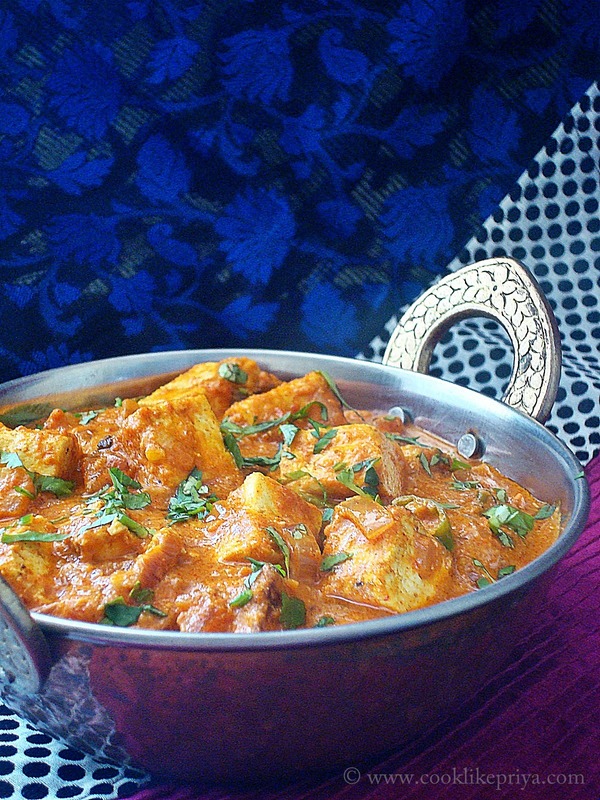 Nalini we both totally enjoyed this Tawa tofu masala and hope you had a wonderful birthday. Can there be someone who does not love Strawberries??? I am no exception I love strawberries and for that matter any fruit. You can call me fruit-a-holic and it would be just perfect ;-). To the contrary my husband is not someone who loves fruits and it would be the last thing be would eat. 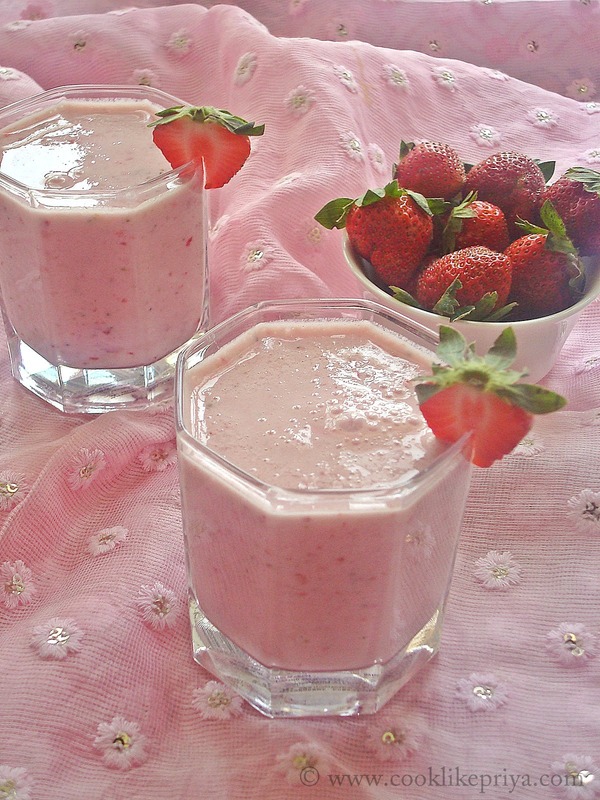 So I made this delicious Strawberry milkshake and he just gulped it all without any fuss. Talking about Strawberry the one person who comes to my mind is +Vijayalakshmi Dharmaraj (who blogs at vijisvirunthu) she is an absolute Strawberry crazy girl. So when a group of friends planned to do a virtual treat for her I jumped in with the idea of making a recipe using her favorite fruit and sorry Viji about the delay in sharing your virtual treat. I hope you had a wonderful birthday :-), here's my simple treat for you.